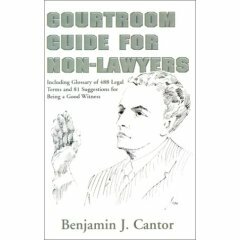 Benjamin J. Cantor has given us the gift of his life experience in the “Courtroom Guide for Non-Lawyers.” This is a very helpful book for those who find themselves unfamiliar with the legal ramifications which take place during trials in courtrooms across America. Since his retirement, he has been a consultant to the Boston Photo Service and has also been conducting seminars on legal evidence photography and the role of the expert witness in a court trial. Interview with the Author – great idea! Information on Direct and Cross-Examination of a Photographer – This gives you a good idea of what to expect if you are called to testify as an expert witness. I’ve already sent a copy of this book to a friend who I think may find it to be useful. Your friends will thank you if they find themselves as a witness and you present them with a copy of this book. I also thought this book would be extent for authors who are doing research on the subject of courtroom procedures. Should that be "Practise" or did I use the right spelling? 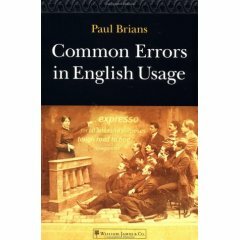 The entries in Paul Brians' "Common Errors in English Usage" are organized alphabetically and provide hours of amusement for anyone who loves language. This book brought back memories of childhood, in those moments where the use of "borrowed" and "lend" were taught at school. Then there is the every present annoyance of "its/it's." Who has not made a mistake while spelling lightening and lightning? Humor abounds as in the picture of man and bear with the caption: "For a moment he was confused - was he being attacked by a bear presently or currently?" This book discusses redundancies, like "DVD disk," but doesn't discuss the difference between CDs and CD's. One if of course possessive while the other is plural. If I said chai tea, would that be a redundancy? Actually, redundancy also means being unemployed. I still like saying chai tea, but this book says it is pointless and it is also called masala chai. As this tea grows every more popular, I'm sure the way we ask for tea will correct itself. Why would anyone use sacred instead of scared? This book also deals with common typos. You have to love uses like "same difference." Why do they say "There is no such word as "verbage" when I do find this word in an online dictionary as "jargon." Of course, an urban dictionary may send some people into a state of shock. The author cautions against using nonstandard and obsolete words and says that just because a word is in a dictionary, doesn't mean it is being "endorsed." If you tend to think up a lot of your own words or like to be playful then some of the entries will make you feel a little rebellious. For those who are longing to perfect their writing, this book can be invaluable. Well, as they say practice makes perfect although my first indication is to type "practise." "Colour vs. Color" is a far less common usage problem, although I must say that as a child, I was smacked on the hands with a ruler for that one. I had apparently learned the word "color" before moving overseas. This book would make a perfect present for anyone interested in language, will provide lots of laughs and will bring back memories from childhood. Frankly, I found this to be a fun book. OK, so now I can't use "Frankly" anymore. This book says that I have just abused the English language. If you have ever lived overseas or have tried to use foreign words, this book unveils faux pas and British/U.S. Spellings. It only took trying to write a cookbook to help me figure out that the use of "desert" and "dessert" were one of the typos I would encounter quite often. Who has not wanted to type "expresso" instead of "espresso." The eccentric humor throughout this calendar makes you smile. Should you use "foresee" or "forsee?" It gets even more fun when you consider using words like "supposably, supposingly or supposedly." Truncated versions of old sayings are clarified, foreign words demystified and pronunciations of words like vinaigrette are explained. 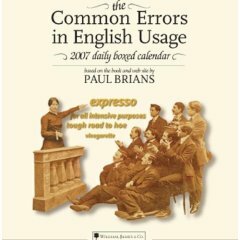 Overall, the Common Errors in English Usage is a humorous calendar with illuminating information for the word lover in you. Perfect for gifts!